A DVD, also known as ‘Digital Versatile Disc’ or ‘Digital Video Disc’, is an optical disc storage media format. It is mainly used for video and data storage. The dimensions of a CD and DVD are equal, but a DVD stores more than six times as much data as a CD does. –	DVD-ROM (Read Only Memory): The data can only be read and not written. 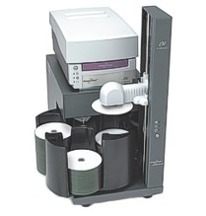 –	DVD-R and DVD+R: Such DVDs can record data only once and then function as a DVD-ROM. –	DVD-RW, DVD+RW and DVD-RAM: The term RW implies ‘re-writable.’ Such DVDs can both record and erase data multiple times. The laser light has a red colour as the wavelength used by standard DVD lasers is 650nm. DVD Video refers to properly formatted and structured video content and DVD Audio discs refer to audio content. Other types of DVDs, including those with video content, are referred to as DVD Data discs. DVD technology has now taken a step forward with the invention of a Blue Ray Disc. Blu-ray disc: A blu-ray disc is high definition optical disc storage medium. Such discs make use of a blue-violet coloured laser and hence a shorter wavelength of 405nm. A blue ray disc stores data six times more than a DVD. The storing capacity is 25GB in case of single layered and 50GB in double layered. These are used for high definition Videos and PlayStation games. This entry was posted on Wednesday, August 26th, 2009 at 5:08 pm	and is filed under Articles.